The passing of UN Security Council Resolution 1325 and subsequent resolutions launched the Women, Peace and Security (WPS) agenda to mainstream gender into matters of conflict and peace building. 1 Advocates hail gender mainstreaming as a window of opportunity for global feminist knowledge transfer in order to promote the transformation of gender relations, particularly in post-conflict societies. Critics have challenged this optimism, arguing that gender works as a Trojan horse, whereby gender mainstreaming initiatives are used instrumentally to legitimize liberal peace building. These two metaphors have come to dominate the debate on “feminist knowledge transfer” in the WPS agenda. 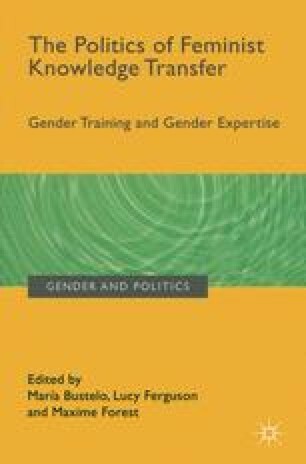 So far, most feminist critiques have focused either on the inadequate translation and implementation of the WPS agenda or on the problematic tendencies of the underlying (liberal) feminism, such as de-politicization or bureaucratization (for an overview, see Ferguson, 2014, p. 2). I argue that we need to ask more fundamental questions regarding ways of conceptualizing the circulation of feminist knowledges.